This course is a minimum of 8 hours and uses the NRA Training module and doctrine to teach the basic knowledge, skills, and attitude for owning and operating a pistol safely. 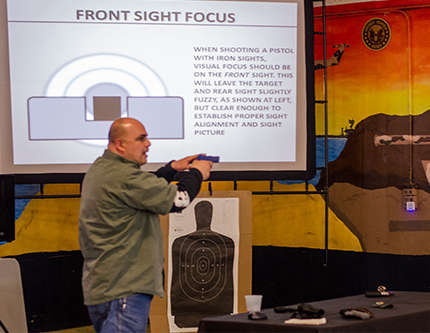 Students will learn the NRA rules for safe fun handling, revolver and semi-automatic pistol parts and operation, ammunition, shooting fundamentals, range rules, shooting stances and much more. Students will need to bring a firearm, eye and ear protection, and a box of ammunition for the practical application portion of the class which includes a live firing exercise. Students are encouraged to bring note taking material, and will be provided with a NRA Training package for further reference. *TSI has several firearms available for our students to borrow at no charge. Firearm rentals, eye and ear protection, and ammunition may be available at range but are not guaranteed. All students are required to pay a $10 range fee.